Cameron Vaux has lost both his father and his wife, Jessie. Now, though he’s only 33, he fears he’s losing his mind, the same way his father’s mind went–one memory at a time. He latches onto something mentioned by both his father and Jessie: God’s book holding all memories, the one mentioned in Psalm 139: “All the days ordained for me were written in Your book before one of them came to be.” Problem is, he doesn’t believe in God. Can he find this book? Could it restore his mind and his memories of Jessie? Clues point him to the little town of Three Peaks, Oregon. He doesn’t want to go there alone. Who will help him? There’s only one person to ask: Jessie’s foster sister, Ann, who has hardly spoken to him for years. 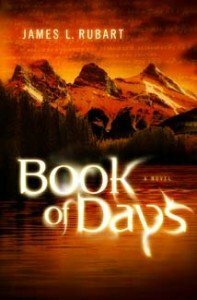 Cameron’s not the only one who wants to find the Book of Days. There are others, and they will stop at nothing to get to the secret of the universe. Cameron soon finds himself a pawn in a vast chess game. Will he escape with his life? I kept turning the pages. Vibrant characters leap right off the page, and an unpredictable story line held my attention to the end. Plus, it’s right up my alley–a story set in the real world with some supernatural elements, reminiscent of Indiana Jones tales. Highly recommended.